Laser resurfacing is a procedure that effectively reduces wrinkles and enlarged pores and is beneficial in the removal or diminishment of hyperpigmentation and acne scars. It is best utilized on the fine lines or wrinkles that appear on the forehead and the area around the eyes and lips. Laser resurfacing may also aid in the removal of benign skin lesions and specific types of pre-malignant and malignant skin lesions. 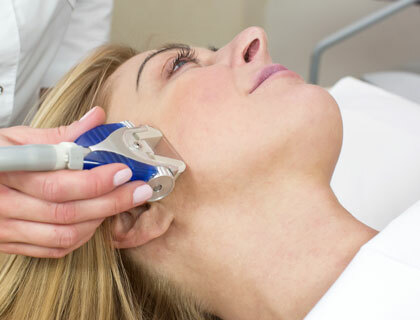 In laser skin resurfacing, short, pulsating beams of light are directed at the skin to heat its dermal layer, resulting in the tightening of collagen fibers. This process stimulates skin fibroblasts, which are responsible for the production of collagen. Various types of lasers are available, including the CO2 fractional laser, widely recognized as a superior treatment due to its combination of the effectiveness of traditional carbon dioxide lasers with lessened side effects. Regardless, the optimal laser for your skin characteristics and condition will be determined during a pre-procedure consultation.